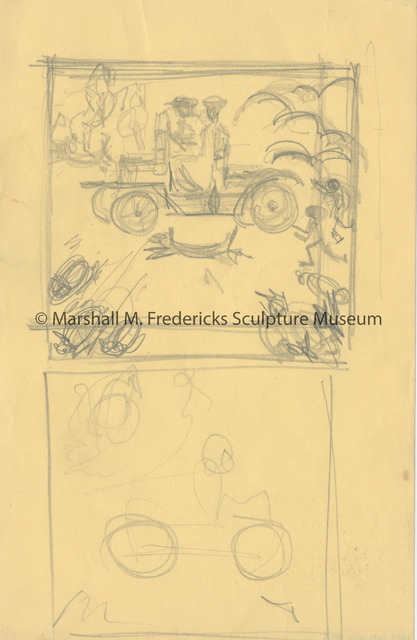 Marshall M. Fredericks Sculpture Museum | Sketches for "Horseless Carriage (Model S. Ford, Children and Animals - Sunday Afternoon)"
Because the automobile industry was the most important factor in the development of the Detroit area, the sculptor has chosen to depict one of the very early cars. The “horseless carriage”, with its two occupants, speeds along, leaving a trail of dust and smoke. Two children and a dog run delightedly beside the car while pigs and chickens flee in terror. Fredericks, Marshall M., 1908-1998, “Sketches for "Horseless Carriage (Model S. Ford, Children and Animals - Sunday Afternoon)",” Marshall M. Fredericks Sculpture Museum, accessed April 20, 2019, http://omeka.svsu.edu/items/show/7305.